North Bay (the area just north of San Francisco) may be one of the best places in the whole world. The woods are dense, the land is fertile, and the people are cool. The food is insane, the beer is better, and the wine is next level. Basically, it may be close to perfect and West Marin is easily at the forefront of it all. Tucked in Inverness Ridge, in Tomales Bay, there are scenic drives everywhere and the sort of woods you never want to leave. This a-frame is rather idyllic with its matte black exterior and modern-meets-bohemian interior. One of the owners is an interior designer and she decked it out as a retreat from city life so expect a killer record collection, great bathrooms, and enough to do for up to 6 guests. As one of LA's local ski mountains, Big Bear is great in the winter and extra special in the summer. This uniquely shaped cabin has a funky midcentury vibe with updated style and all the pots and pans you could ever need for 5 people in the mountains. That blacked-out exterior aesthetic is extra photogenic, but once you're done staring, you'll still have plenty to do with miles and miles of hiking trails straight out the back (and front) door. With a wood fire stove and a rain shower, you might not want to head out too quick and no one's going to blame you. This little nugget is for when you want to stay in a cabin, but you've got to be in LA. As a detached studio, it has its own deck, kitchenette (with hot plate), and bathroom. It's right in the middle of Silverlake while remaining secluded and simple, not feeling overdone. Since you have your own entrance and parking, you're free to keep to yourself or chat with the super friendly property owners. 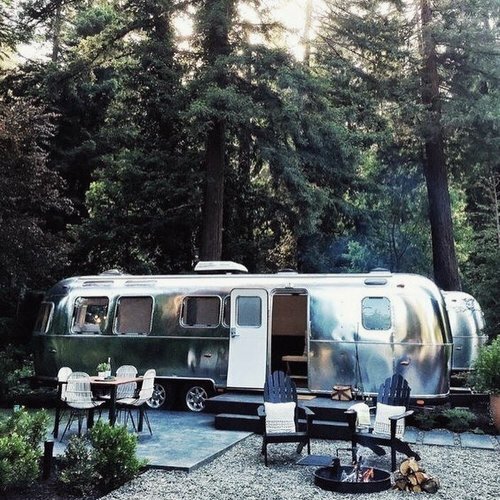 They have two locations: Russian River and Santa Barbara, so you can camp out in fully renovated Airstreams in either Northern or Southern California. Their ethos revolves around the idea that good design is essential, but that we have to take care of the environment. Marrying camping with the great American road trip, they have midcentury inspired campers, weekly playlists, and a really cool common area for anyone staying on the property. You'll get your own airstream when you book and, if you want, you can get involved with all the local food and drink (Russian River, specifically, is known for its breweries). Whichever location you pick, you'll be nestled among trees and immersed in the experience of nature. Mythic unto itself, Esalen is known for its baths (hot springs cut into the cliffs of Big Sur), its progressive thought, educational seminars and workshops, its beautiful grounds, and transformational space. 120 acres between mountain and sea, there are giant redwoods on the property and countless secret spots to be found. If you can find a workshop to get you here, book it and enjoy. There really aren't too many words to describe it and that's the magic. 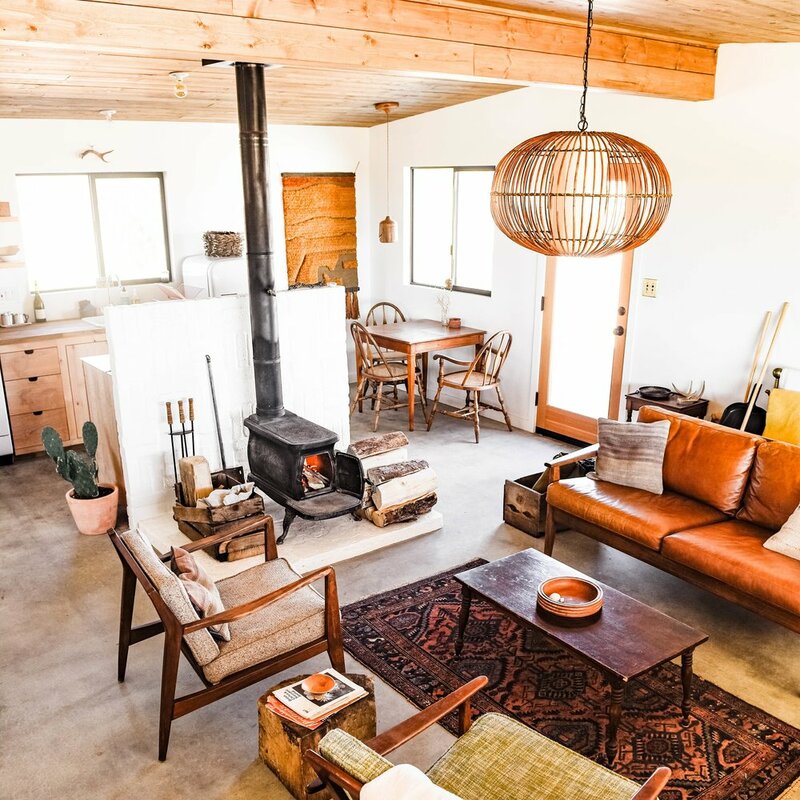 Newly finished, this two room cabin feels like all the desert vibes you've been looking for: light, not try-too-hard, well decorated, and the coolest kitchen ever, it even has a little (detached) casita for extra sleeping space. It comes stocked with wood and the essentials, plus it's just far away enough that you feel secluded but can still run to town for food and whatever else. Excellent for a self-imposed work retreat, a friend session, or an excuse to watch a gorgeous sunrise (followed by a beautiful sunset). There are a few different cabins on this property -- the Red A Frame, Log Cabin, and the A Frame (pictured) -- there's also another property, down the forest road, that has Base Camp and the Black A Frame. These structures are inspired by the simplicity of Scandinavian modernism and rustic California design, they're on 22 acres just south of Yosemite, with a little brook running through the property and a large meadow just out the back. If you choose one of the first three structures, there's a caretaker on the property to help you with anything you may need, but other than that, you're on your own and you've got the run of the place. There are woods to explore, a bbq to take advantage of, and plenty of space to just enjoy. This property is in southern Big Sur and it's in love with all sorts of round structures. From yurts to tents to nests, this land is covered in native chaparral and some very unique dwellings, all rentable. If you're interested in camping, you can bring your own tent as well. Like most of the people in Big Sur, Treebones is rooted in inclusivity and they pride themselves on being quirky, honest, open, simple, and approachable. The central coast is one of the most beautiful places in the state and you're going fall in love with the community, wonder, and landscape of it all. It really is a place hard to describe so, for this one, be sure to click thru to get a feeling -- it's definitely more camping than cabins in a good way. Located in Idyllwild - Pine Cove, this copper roofed a-frame is nestled among some winding roads, not far from town, and just out the back is an adorable little bridge, hot tub, and bbq. Right up the mountain from Palm Springs, you can take the tram down, or stay up in Idyllwild, enjoying the music and amazing local hikes. This particular a-frame has a lot of outside space so the fact that the sleeping situation is mostly an open-loft deal isn't much of a thought. A major plus: Chris, the groundskeeper is the best local guide you could hope for.